Home / travel / A Zermatt Ski Trip Is Just What You Need! If you want the vacation of a lifetime, a Zermatt ski trip is a must-do! Here youll be on Europes highest ski resort with snow year-round. Sitting next door to Italy, there is 360 km of pistes with ski lifts that reach the highest heights so that you can have the thrill of skiing down them. Or simply just stay up on the peak and enjoy the breathtaking view below. There is no Zermatt ski trip that shouldnt include a trip up the Klein Matterhorn. You will have a 4,000-meter view from 3,883 m and the great Matterhorn will be the center of your view. No matter your skiing level, there are pistes that have been carefully groomed to fit any skill level. And as youre coming down the mountain, enjoy the box stops where youll find some of the most famous and cozy restaurants next to the pistes. 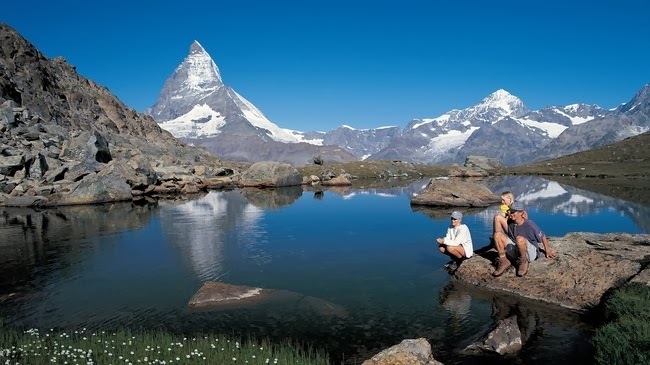 Only a Zermatt ski trip will offer visitors the most pristine slopes on 38 towering mountains. And if youre up for heliskiing, Air Zermatt is there and ready for you. A Zermatt ski trip can be a dream come true with a peak of a four-thousand-meter alp, youll feel as if you are among the stars. There are plenty of Zermatt ski lifts that are perfect for beginners, including practice pistes for the kids and adult beginners. Here a beginner can learn to ski in a fun and relaxed, pace that is stress-free and still enjoy the awesome view of the Matterhorn. A Zermatt Ski Safari On The Matterhorn! This safari is a definite must-do for any ski adventure lover! Over 12,000 meters altitude on the Matterhorn ski safari gold and over 10,000 meters of altitude on the Matterhorn ski safari silver, youll get all the adventure you could want. And you wont experience any piste more than once how much more thrill and views could you ask for?! Each of the panoramic mountains offers you a different background for that selfie youll want to post on your social media pages. What makes this Zermatt ski safari even more unique is that youll see all of these in one day! Youll start your Zermatt ski adventure safari on Rothorn and by way of Riffelberg, the Theodul Glacier, and the Trockener, the circuit will continue until you have reached the 3,883 m of the Matterhorn glacier, the 2,050m of Italys Breuil-Cervinia and Testa Grigia at 3480 m. That evening, youll return via Stafelalp to Zermatt. Beginners can enjoy the mountains and discover the beauty of it all as they take their first ski run with a ski teacher. Or you can go along with a mountain guide and climb the Matterhorn. Either way, you can be sure that your Zermatt ski trip will be complete when you partner with one of the competent and experienced Zermatt guides. The activities available on a Zermatt ski trip are dependent upon the time of year, but you can be certain that there are a variety of activities all year long. If youre there during the Zermatt carnival, youll find a village that is full of carnival-goers and carnival activities for kids of all ages. There are many different foods for your enjoyment, both local taste, and international flavors too. And if you arent involved with any Zermatt ski activities, then Bahnhofstrasse is the main street of this car-free village where youll find several boutiques and restaurants. From cozy and quaint to the high caliber and pricey, there are souvenirs to be found for those you left back home. Along this main street of your memorable Zermatt ski trip, youll find cozy hotels offering their own on-site bars and restaurants, open to the public.